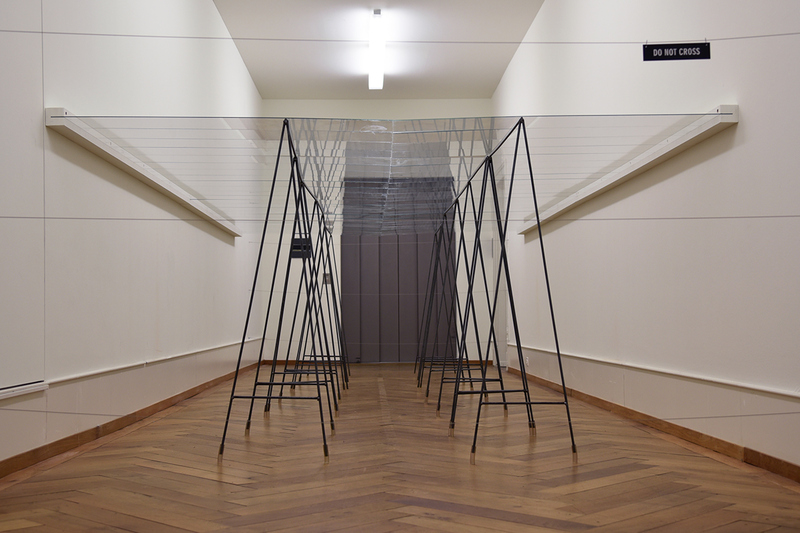 The work Do Not Cross is conceived as a part of the Master thesis and it was performed for the first time at the final exhibition at the Centre Pasqu Art in Biel. The work consists of three segments: installation-performance-installation. My idea was to cut off the space at the height of my neck with a glass surface which was suspended between me and the audience. The performance did not start with my positioning in the space, but rather the positioning of the glass which blocked one part of the space straight away. By moving towards the audience I cut my way through the glass. In other words, the resistance of the glass, in this case, determined whether I would be able to go through it to the end. This was a very delicate process which demanded great concentration and calm on the part of the performer. Once I stepped inside the glass there would be no turning back – I would have to go forward to the end or as far as I was able to. The feeling of constraint, which was caused in this case, enlightened me about the maximum pressure I could take. After doing the performance I intended to leave the construction, with the marked route of my movement, standing in the space for a couple of days as a memorandum of that event, namely, the second installation. ”Two sets of 6 elegant metal blocks standing neck-high in parallel to the walls of a corridor more than 6m long positioned between the elevator and entrance. With the help of a wooden mounting, loosely clamped panels of glass are supported by the metal blocks and meet in the centre. The supported glass surface splits the passage into an above and a below, thereby creating a visual horizon. The performer appears in front of the elevator, wearing light, formal clothing and walks into the centre. In her right hand, she is holding a tool which resembles a pair of pliers and her expression and posture radiate determined concentration. After 20 minutes of clanging sounds, she cuts herself a passage up to her neck in height and cleaves a precarious way over to us. The tempo varies, the shoes grind their way across shards of glass and the cracking sounds of cutting, dropping and shattering glass create their own soundscape. ”Sanja Latinovic’s performance impressed through its simple form, the fierce intrusion of the pliers and the materiality. The spatial setting of the corridor situated in the old part of the Pasquart centre works compliments the performative idea well: to cleave a way through the glass panel. The panels were laid out across the room in regular lanes that met in the centre. The ends were fixed all along the wall by means of wooden slats. The glass panels were held up by racks made from iron rods that came up to the performer’s neck. 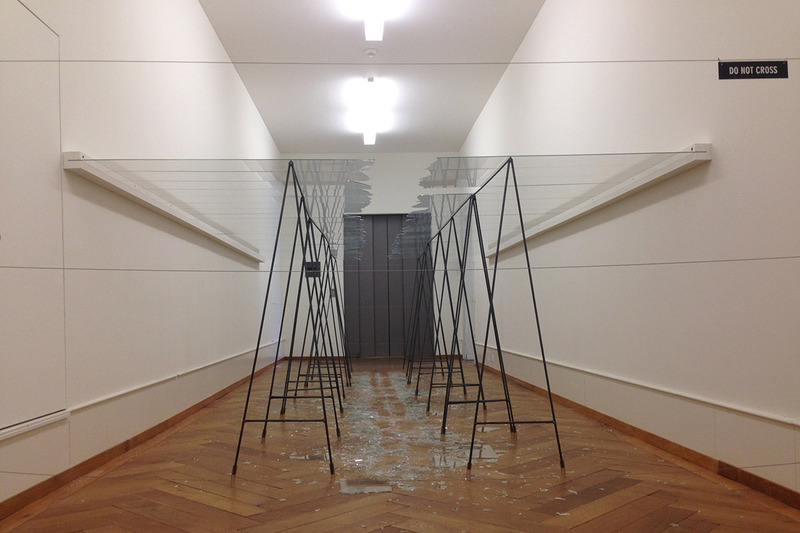 The installative setting of the glass panels and their fragility already showed promise. With a pair of pliers, the performer afflicted the glass panels in the middle of the corridor so that large and smaller pieces of glass fell and crashed to the floor. As such, a narrow passage was made in the glass, which allowed the performer to gradually pass through. She cut and crashed her way forward through the glass, while the inner edges of the cut glass formed dangerous sharp jags. While the performer’s path and her actions were predictable, the glass always splintered in new ways, ensuring no moment was boring. The clothes worn by the performer were simple (light trousers, sleeveless body); the closed shoes were sensible, so that she could easily walk over the shards of broken glass. Her clothing represented protection and fragility simultaneously. The strain – both physical and, even more so, psychological – was crearly palpable for the audience in the room. This tension was upheld amidst the observers until the very end. Depending on where the observer was standing, one could either see her body up to her neck or one could see her head but her chest was covered. Due to the spatial situation, most of the audience were standing in front of the installation, which saw the performer edging towards them. Rad Do not cross je zamišljen kao deo Master teze i po prvi put je izveden u Centre Pasqu Art u Bilu. Rad se sastoji od tri dela: instalacije – performansa – instalacije. Staklena površina postavljena u visini vrata preseca prostor u dužini od 6m, gradeći tako viyuelni horiyont. Performans ne počinje mojim poyicioniranjem u prostoru već postavkom stakla koje blokira deo istog. Krećući se ka publici yasecala sam staklo pred sobom. U tom slučaju sam otpor materijala je diktirao da li ću biti u mogućnosti da do kraja prokrčim sebi put. Osećaj stešnjenosti, koji je bio izazvan u ovom slučaju, ispituje maksimum pritiska koji mogu podneti. Nakon završenog performansa, instalacija, kao svedok dešavanja, ostaje u prostoru i predstavlja treći segment rada.